there is usually a showstopper room at the san francisco decorator showcase. last year, it was the living room by catherine kwong design, with a cy twombly like floor. who paneled the bedroom in blue and white portugese tiles, called azulejos. martins, who was born in portugal, grew up in brazil, and now works in san francisco and lisbon, re-imagined the traditional tiles as contemporary art. one of martins’ relatives loaned the 17th century portugese bilros bed to him for the showcase. martins imported the family heirloom to san francisco and had it restored. another relative assisted martins by taking photographs of the portugese tile collection at the museu nacional do azulejo (MNAz) in lisbon. martins collaborated with decorative artists linda horning and katherine jacobus, who painted the 243 masonite wall panels for the bedroom from the museu nacional do azulejo photographs. they took some artistic license. to modernize the azulejos, they increased the size of the 4″x4″ tiles to 24″x24″ panels. but, they wanted the 24″x24″ panels to appear authentic. so, they applied a crackled finish on the panels to replicate the crackled glaze on the tiles. and, they painted the scenic panels in sequence, so that the panels would seem historically accurate. martins deconstructed the scenic panels, then reconfigured them, and installed them on the bedroom walls. the deconstructed panels of azulejos could be compared to contemporary art. and, the bedroom could be compared to a contemporary art gallery. not only are the floors and ceiling painted white. but, each corner also contains a sculptural composition. the wall panels and the window coverings are so well coordinated that the fabric looks like it could have been hand painted by horning and jacobus. the bed is framed by contemporary furniture. vintage john dickinson african side tables at the head. and, folding stools in the style of poul kjaerholm at the foot. a contemporary brass sideboard, which acts as a vitrine for blue and white porcelain vessels, is the focal point of the opposing wall. when i visited lisbon in 2004, i thought that some of the contemporary azulejos at the museu nacional do azulejo (MNAz) were as outstanding as some of the historic tiles. the MNAz owns the largest portugese tile collection in the world. so globally, it is considered one of the most important ceramics museums. 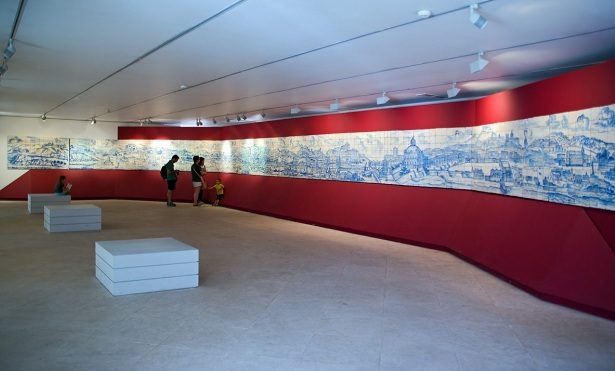 highlights of the MNAz collection include a panoramic scene of lisbon prior to the earthquake that devastated the city in 1755.
which do you prefer? historic or contemporary azulejos? the word azulejo is derived from the arabic word الزليج (az-zulayj): zellig, which means polished stone. azulejos are square ceramic tiles, which are decorated on one side, often with tin glaze. tin glaze is a lead glaze with tin oxide added to make it opaque. tin glaze does not run when fired, so tin oxide is also a pigment stabilizer. azulejos have been used as a traditional component of portugese architecture since about 1500, when king manuel I (1469-1521) imported tile from the mujedar workshops in seville, spain to decorate his palace in sintra, portugal. seville became a tile manufacturing center under moorish rule between the 8th and the 13th centuries. in portugal, azulejos have been used as an ornamental or functional building material on the interior or exterior of public or private buildings since then. in addition to the influences of hispano-moorish geometric tile, other stylistic influences include italian polychrome majolica, and dutch blue and white delft ware. azulejos patterns followed historical design trends. the late 17th and early 18th centuries are considered the ‘golden age’ of azulejos. i thought that the azulejos at the palacio dos marqueses de fronteira were showstoppers, too.